Concerned about the rising cost of course materials for students, Brookdale Community College biology professor Carey A. Fox decided to try something different this past spring in her Life Sciences class. Instead of using a traditional textbook, which costs $124 in its loose-leaf format, Fox decided to search for suitable open educational resources, or OER, so that students could access the course materials for free. She discovered Concepts of Biology, a textbook offered through OpenStax College, a nonprofit based at Rice University that seeks to make “open-source” textbooks available to students for free online. Fox decided to pilot the textbook this past spring for two online sections of the course that she teaches. The effort evidently paid off. Fox reports a 10 percent increase in successful completion of the course over the previous semester in both sections. “And the reason was students actually got the book,” says Matt Reed, vice president for learning at Brookdale Community College, a Lincroft, New Jersey-based institution where 40 percent of the students are Pell Grant eligible. A growing number of colleges are beginning to turn to OER. This June, for example, Achieving the Dream (ATD) — a community college reform network — announced the “largest initiative of its kind” to develop degree programs using high-quality OER materials. The initiative — which involves 38 community colleges in 13 states — is meant to help remove financial roadblocks for students and to “spur other changes in teaching and learning and course design that will increase the likelihood of degree and certificate completion,” according to an ATD description of the initiative. 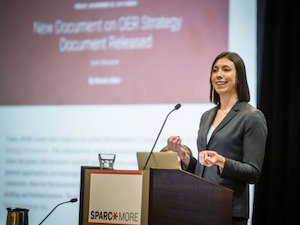 Advocates for free course materials say, as OER becomes a more common feature on the higher education landscape, it will benefit all students, but especially low-income students. “Students already face crippling costs to attend college, and expensive textbooks can be the straw that breaks the camel’s back, whether that’s working more hours, taking on additional debt, trying to get by without the textbook, or dropping out altogether,” says Nicole Allen, director of open education at SPARC, the Scholarly Publishing and Academic Resources Coalition, which is based in Washington, D.C.
“OER promotes equity by ensuring all students can access their assigned materials on Day One of the course, not just those students who can afford it,” Allen says. Fox agrees, and attributes the increase in course completion to the ease with which students were able to obtain the course materials. The textbook was available as an e-book, a hardcover version that could be purchased online for $29 or less, or a pdf version that could be printed by the student. It was also available as an iBook, and in a Digital Accessible Information SYstem, or DAISY version, for the visually impaired. A review of empirical literature on OER found that students and instructors’ experience with OER has been mostly positive. Marian Anderfuren, associate vice president of interactive communications at Tidewater, says the program was meant to respond to studies that show students often forgo purchasing textbooks and, consequently, don’t do as well academically. For instance, the 2015 National Survey of Student Engagement, or NSSE, found that 31 percent of first-year students chose not to purchase required academic materials due to their cost — up from 27 percent in 2012. The College Board estimates that the average full-time undergraduate at a four-year public college spends about $1,200 per year on books and supplies. “OER ensures that every student will have everything they need from Day One,” Anderfuren says. Anderfuren cited internal surveys that show 85 percent of Tidewater students who had completed a textbook-free course would choose a Z-course over a regular textbook course. The same amount say OER content offered a “very effective” way to learn, and 58 and 40 percent rated Z-course quality as better or about the same, respectively. “Our use of OER is leading to better completion rates and grades,” Anderfuren says, noting that Tidewater expects to expand its Z-Degree offerings this fall. Fox reported similarly positive results. “I loved the e-textbook,” one student wrote in a post-class survey. “I also loved that it was free. I thought the assignments on there were excellent. I loved that it gave options for extra practice. Despite the “many benefits” to using OER, there were also “a few drawbacks,” Fox says. Fox also cited problems with the supplemental materials for OER. “The supplemental materials for the OER aren’t as rich as those in traditional textbooks, as least not yet, so I needed to supplement myself, extensively,” she says.Allen says the extra work is worthwhile. “It’s true that faculty can end up putting extra effort into their course when they adopt OER, especially if they adapt or tailor it to better suit the learning objectives,” Allen says. “If putting in a little extra work means that 10 more students complete the course, then it’s hard to imagine an instructor saying it’s not worth it — though it shouldn’t have to be a matter of sacrifice.”Allen says it’s important for faculty to have support for transitioning to OER. Fox says she plans to use OpenStax again this fall. Jamaal Abdul-Alim can be reached at jabdul-alim@diverseeducation.com.